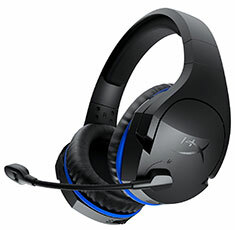 The HyperX Cloud Stinger Wireless is designed for gamers who want a solid 2.4GHz wireless connection for their PS4 systems. Just plug the small adapter into an available USB port, and you’re ready to go. With signature Cloud comfort and a long-lasting battery (up to 17 hours on a single charge1), Cloud Stinger Wireless has what you need to keep gaming through the night. If you need to step aside for a moment, the ear cups rotate 90 degrees, so you can rest the headset comfortably around your neck. The closed-cup design and 50mm drivers with enhanced bass pump out crisp, clear audio to keep you engaged in your intense team fights or immersed in the digital drama unfolding in that key cutscene. Cloud Stinger Wireless includes several gamer-friendly conveniences, like on-ear-cup volume controls to give you direct access to headset volume and a swivel-to-mute mic to quickly silence yourself. It comes backed with a 2-year warranty and free tech support.